The report titled “Malaysia Industrial Water and Waste Water Treatment Market Outlook to 2022 – By Region (North, Kuala Lumpur, South and East, and Sabah and Sarawak) and By Industry (Agriculture and Food, Palm Oil, Oil and Gas, Electronics, and Others)” provides a comprehensive analysis on the Malaysia Industrial water and waste water treatment market. The report covers various aspects including an introduction, Ecosystem, Market size by revenue, Market By Region (North, Kuala Lumpur, South and East, and Sabah and Sarawak) and By Industry (Agriculture and Food, Palm Oil, Oil and Gas, Electronics, Paper and Pulp, Latex and others), growth drivers, restraints, key regulations, future outlook and analyst recommendation. 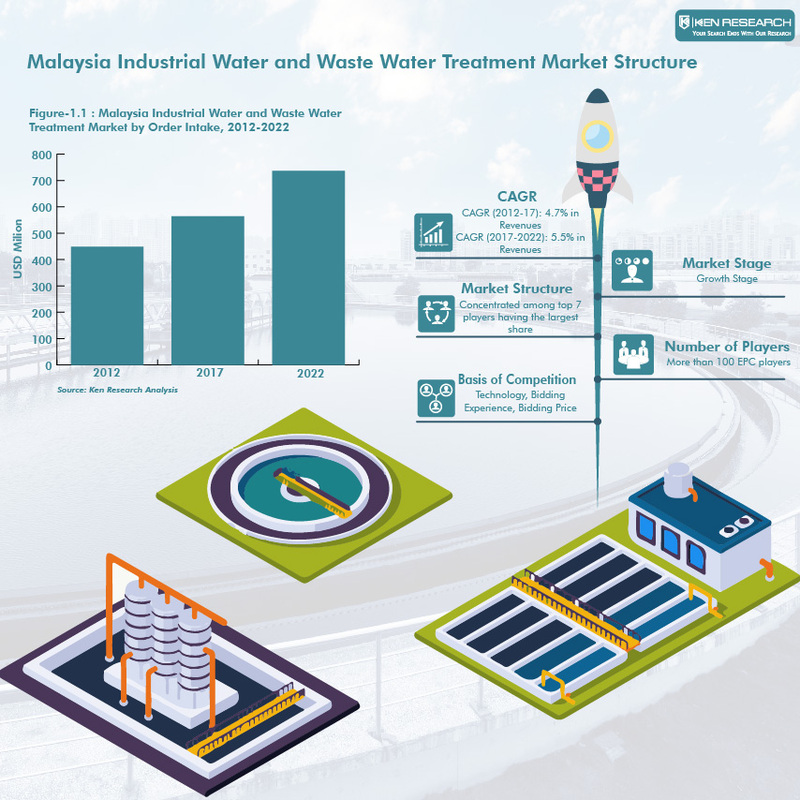 Industrial water and waste water treatment industry in Malaysia registered a positive five year CAGR during 2012-2017. The growth was mainly driven by strict implementation of regulatory norms and scarcity of water promoting the industries to use recycled water. Increased demand for energy and rise in manufacturing industries has promoted the development of water treatment industry. By Region: Sabah and Sarawak region of Malaysia is the biggest market for water treatment industries accounting for majority of new orders in 2017. Heavy penetration of industrialization in Sabah was the key driver. Southern and Eastern coast region were the second largest contributors with significant market share. It was followed equally by Northern Malaysia and Kuala Lumpur especially after announcement of projects to clean Pantai and the Penang Industrial Complex. By Industry: Agriculture and Food was the largest users of water treatment facilities in Malaysia. The country relies on agriculture as it is one of the 3 main standard pillars on which a country’s economy is gauged. It was followed by Oil and Gas industry. Rising demand for Oil and Oil based products has increased the demand for water treatment in this industry. Malaysia has emerged as an Electronics and Latex hub promoting large scale use of high grade treated water in this industry. Textile, tannery, pharmaceuticals, automobile, electronics are some other key sectors where there is demand of water treatment. Majority of the new contracts are in small scale segment are garnered by local companies with some large scale projects being handled by the industry leaders in Malaysia. Companies operating in EPC business in industrial water and waste water treatment are also engaged in developing infrastructure in Sewage treatment and municipal water treatment for drinking. Many Large scale projects are still in the bidding stage. Salcon Berhad continues to lead the market in Malaysia Industrial Water and Waste water treatment market due to their better capabilities and vast experience in developing projects in water treatment industry in Malaysia. It is expected that market will register constant growth registering a five year CAGR of approximately 6%. Demand is expected to be highest in the Sabah and Sarawak followed by the Southern and Eastern coast of the country. Cities along river coasts are expected to emerge as new hubs with highest growth potential. Demand is expected to rise in Ultra Filtration and Reverse Osmosis segment as strict regulations regarding water discharge and conservation comes into play. Future for industrial water and waste water treatment is very much regulation driven and degree of implementation of existing or upcoming regulation will act as the key driver of the market. Centrifugal pumps will continue to witness higher sales in the future as a result of its lower price as compared to positive displacement pumps.